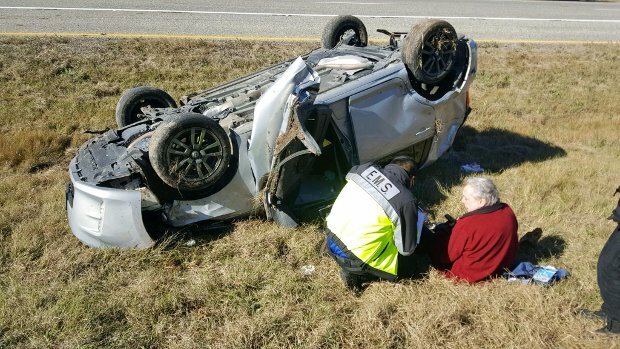 Country legend Mickey Gilley and his son Michael have been injured after being involved in a roll-over car crash. According to authorities, the pair were in southeast Texas on their way to Greenville, TX in Michael's 2013 Toyota SUV when another vehicle drove through a stop sign and caused Michael to swerve and make contact with another vehicle, sending the van into three to four rolls before coming to a stop. Police at the scene said Gilley appeared to be unhurt and was sitting on the side of the road signing autographs; however, his son insisted he go to the doctor where it was found that he had a broken shoulder and ankle. Michael had only minor bruises. Both returned to Pasadena to recover. Gilley, 81, was born in Natchez, MS and was the cousin of Jerry Lee Lewis and evangelist Jimmy Swaggart. Professionally, he played in New Orleans and at clubs in Pasadena, occasionally recording a single or album, but it was opening his nightclub, Gilley's, in Pasadena that started to put the spotlight on his talents. In early 1974, Gilley hit the top of the country charts with "Room Full of Roses" and followed with fifteen more chart toppers through 1983. His biggest hit, a cover of "Stand By Me" (1980 / #22 Pop / #1 Country / #3 Adult Contemporary), came from the soundtrack of the film Urban Cowboy which was partially shot at Gilley's club.